Notes: The late Michael Fong wrote a nice article for "Fly Fisherman Magazine" entitled, "Western Hex Fishing". I believe it was in the mid-Nineties. 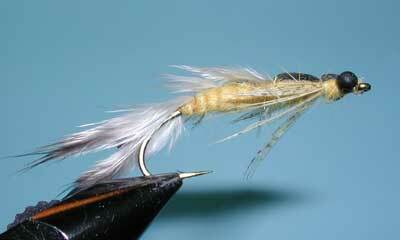 He highlighted fishing Lake Almanor with Guide Milt Jensen who created this fly. His recipe called for a ribbing of "36 Gauge brass beading wire" and using a wrapped Ginger or Brown Saddle Hackle for the legs. He mentioned that Milt preferred Furnace Saddle Butts for the gills and tail but also used a natural brown saddle with a silvery, medium dun coloration. Michael also called for an epoxy finish to be applied to the wing case and head carapace for a glossy appearance. Michael indicated that this fly could be fished in open water for the trout but that smallmouth bass would like to hit this fly around structure.